My sincere apologies for not posting any reviews (I have several drafted and almost ready for posting, insha’Allah) and articles over the past week. Things have been a bit hectic around here and I have been preparing for the poetry celebrations starting in April (look out for some great poetry). Today I introduce a new feature here on the blog. In the “What we’re Reading” posts, I will mention the interesting books my son is enjoying. Some he reads on his own and others we read together. 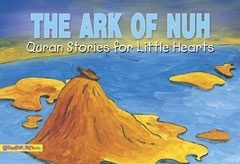 The Ark of Nuh by Saniyasnain Khan. (2006). Goodword Books. Nonfiction. 24 pages. Paperback. ISBN 8187570873. The Ark of Nuh has been of particular interest to my child. He loves seeing the animals marching toward to Ark. The illustrations are lively and attractive for young children. We take time to talk about the variety of animal species created by Allah describing how Allah is Al Khaliq (the Creator). We don’t dwell on the drowning of people but instead focus on the beautiful world Allah created and how wonderful it felt for the people on the Ark and the animals to leave it and start life again. The Heinle Picture Dictionary for Children by Jill Korey O’Sullivan. (2008). Heinle. Nonfiction. 160 pages. Paperback. ISBN 978-1-4130-2256-8. The Heinle Picture Dictionary for Children introduces children from ages 4 – 8 to a wide range of vocabulary. It is a wonderful resource book to have around the home and in the classroom. A vast vocabulary is presented to children in an easy-to-read and fun way. Each two page spread introduces a theme (such as seasons, school, animals, time etc.) and the pictures on the pages are clearly labelled clearly. My son enjoys the ‘Rhyme time’, ‘Fun Facts’ or ‘Story’ which are featured at the top of every page. Seeds Grow into Plants by Mario Lucca. 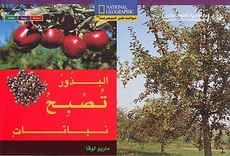 (2001; 2006 Arabic Edition). National Geographic Society/Arab Scientific Publishers. Nonfiction. Paperback. 12 pages English; 12 pages Arabic. ISBN 9953291772. Seeds Grow into Plants is a dual language book that introduces a child to the world of seeds and plants in Arabic and English. Readers are shown four different sets of seeds (pumpkin, wheat, apple and bean) and asked “What will grow from these seeds?” The following eight pages depict the type of plant the seed will grown into and the produce that comes from that plant. Photos of actual seeds and plants that used are stunning and vivid. My son enjoys comparing the various types of plants and how they are shaped differently. For example, pumpkins grow on vines (never on trees! ); wheat in stalks like grass and apples on trees. The Arabic is simple enough for child to understand. The letters are vowelled and spaced well on the page making reading the Arabic easier (for those first language is not Arabic). I read to my child in Arabic and English when I can (he reads it in English on his own) helping to reinforce the Arabic words he is learning by listening to my voice.